Read and Write Odia on Facebook and Emails. i. Aprant Software has been installed ( this will also install the Aprant font as well ) on your computer. If not please click here to download now. ii. You know how to use Aprant Software on windows applications such as Wordpad, MS Word etc. If you don’t know how to use Aprant Software please read the User Manual included in the software. 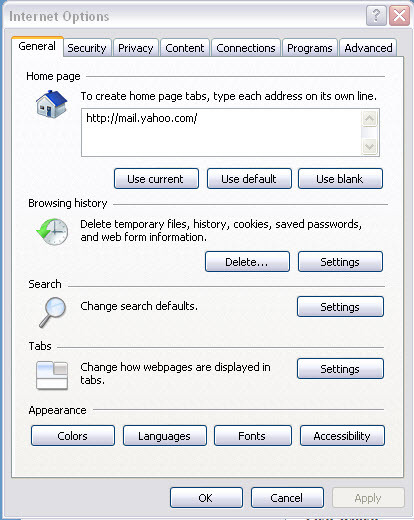 Now let us see how to use this software perfectly on various internet browsers such as IE, Firefox, Chrome , Safari etc. 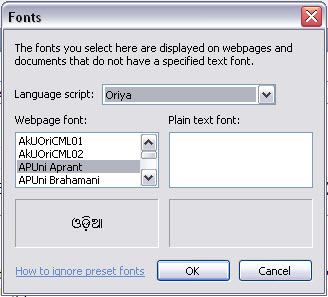 Since Unicode for Odia language is not fully supported on Windows XP, you need to prepare your browser accordingly to setup the default font for Unicode Odia. 2. The above will bring a small window. Select the “Fonts” button located on the bottom of this Window. See below. 3. This will bring another small Window as below. Please select “Language Script” as “Oriya” . This will bring up a list of Odia Unicode fonts installed on your system. Select “AP Uni Aprant” or “AP Uni Aprant Classic” font . Click OK and exit from the windows. See below. 4. Now your I.E browser is all set with Aprant Odia Font as default font for Unicode Odia. You can change this font in future if you like . But we would recommend Aprant Odia Font as it supports max. number of Odia Juktakshyara. Now your computer is all set for Reading and Writing Odia for Any Unicode font based Text or content. 2. The above will bring a small window. 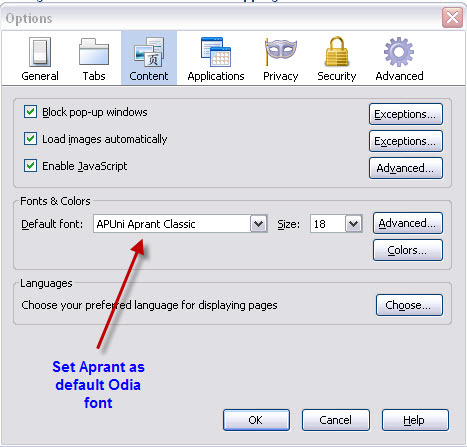 Higlight the “Content Tab” and select the “Default Font” to “APUni Aprant” or “APUni Aprant Classic” as shown below. Your firefox browser is now ready to read and write Odia. Same thing can be carried in case of Google Chrome and Safari Browsers. Since your browser is ready for Odia, you can now start writing Odia wherever you want on your browsers ( such as facebook, orkut or yahoo email etc. ) using Aprant Software. Yes pressing the F11 key…..
Windows Vista and Windows 7 support Unicode Odia almost 100%. By default Odia font that comes with these OS is “Kalinga” and are set as default by browsers as well . So if you wish you can set “Aprant” font as default font ( of course we would like to recommend you to do that ) as explained above for “Windows XP”. It is up to you. If you are happy with Kalinga font then leave as it is and you don’t have to worry about any setting on the browsers. Honestly speaking I personally feel the look and feel ( shape) of the Kalinga font could have been better.